The Artisan Bamboo Salt Sampler Set is the definitive gourmet salt collection. 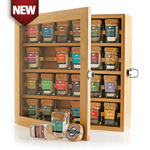 This complete sampler includes 24 mini glass jars each with a hand milled cork top. The entire set is displayed in a gorgeous bamboo presentation box. This is the ultimate gift for the serious chef or salt connoisseur. Murray River - A mild delicate, salt from South Australia’s Murray River. Durango - Pacific sea salt naturally smoked with premium Hickory wood. Kala Namak – A unique strongly flavored salt used extensively in Indian cuisine. Fumee de Sel - This is a handmade salt smoked over Chardonnay oak with a savory hint of wine. Mediterra - This is a salt from the South of Italy, and is known for its mild flavor and bright white crystals. Peruvian Pink – Hand-harvested from spring-fed ponds in Peru’s Andes Mountains. Fleur de Sel - The “caviar of salts” is harvested in the Guerande region of France. Trapani – Handcrafted from traditional salt pans along the famous “Salt Road” in Sicily. Pacific Blue - An All Natural Kosher flake sea salt, harvested from the Pacific Ocean. Cyprus Flake - Mild, flaky Mediterranean sea salt. Salish - Pacific sea salt cold smoked with Alderwood. Mayan Sun - This is a tropical sea salt with a great flavor and high mineral content. Bolivian Rose - This is a rare salt harvested from the Andes Mountain range in Bolivia. Sel Gris (velvet, fine, coarse) - Sel Gris is known for its color, minerals, and high moisture content. Flower of Bali - A natural tropical pyramid-shaped salt. Cyprus Black Lava - Mediterranean flake salt mixed with activated charcoal, imparting a unique earthy taste. Himalayan Pink - This is a pure, mined salt found deep within the pristine Himalayan Mountains. Alaea - Traditional Hawaiian table salt, all natural with a rich red color. Hiwa Kai - This unique Hawaiian salt has a stunning black colorand silky texture. Yakima- Sweet Applewood smoked sea salt. El Dorado- Mesquite -Sea salt smoked with genuine Mesquite wood, the official smoke flavor of Texas barbecue. Flor de Sal - Premium hand harvested sea salt from Portugal.